CAMDEN, New Jersey, March 7, 2012 (ENS) – Months of pressure from consumer, public health and concerned parents’ organizations worried about the health effects of the chemical bisphenol A in canned food linings are having an impact on the Campbell’s Soup Company. The New Jersey company says it has begun to phase out the use of the chemical in its cans. Exposure to BPA, used to make the epoxy-resin linings of metal food cans, has been linked in lab studies to breast and prostate cancer, infertility, early puberty in girls, type-2 diabetes, obesity and attention deficit hyperactivity disorder. Childhood exposure worries parents because this endocrine-disrupting chemical can affect children’s hormonal systems during development and set the stage for later-life diseases. At a February 22 shareholder meeting, Campbell’s Chief Financial Officer Craig Owens reported that the shift to BPA-free cans has begun and could be accomplished without major cost to the company. “We have already started using packaging lined with a BPA alternative in some of our soups, and we are working to phase out the use of BPA in can linings in the rest of our canned products,” the company states in its report. 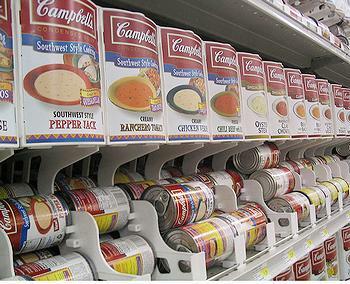 But Campbell’s has not offered a timeline for the phase-out nor identified what materials it will use to line its cans instead of BPA. In the last six months, more than 70,000 letters have been sent to Campbell’s by supporters of the Cans Not Cancer campaign. These letters include nearly 20,000 from the nonprofit Healthy Child Healthy World, which for 20 years has been empowering parents to protect children from harmful chemicals. Last September the Breast Cancer Fund released a report that found BPA in canned food marketed to children – Campbell’s Disney Princess and Toy Story soups tested the highest. A November Breast Cancer Fund report found BPA in Campbell’s turkey gravy and cream of mushroom soup. 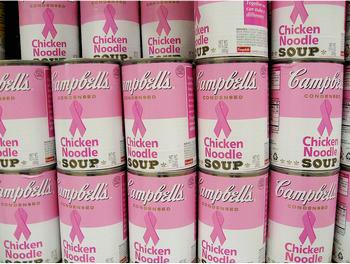 Both reports, as well as the growing consumer pressure on Campbell’s to get BPA out of its products, are part of the Breast Cancer Fund’s Cans Not Cancer campaign. Other canned food companies have already stopped using BPA. A 2010 survey by the nonprofit Seeking Safer Packaging found Hain Celestial, which makes Health Valley, Earth’s Best, and Westbrae Natural brands; ConAgra, which makes Chef Boyardee, Hunt’s and Healthy Choice brands; and H.J. Heinz had removed BPA from their canned foods. Muir Glen, a subsidiary of General Mills, announced in 2010 that it would switch to metal can packaging that does not contain BPA. Over the past four years, 11 states have restricted BPA in infant food containers. The U.S. Food and Drug Administration is currently considering a BPA ban and there is legislation before Congress that would ban the use of BPA in all food and beverage containers.